I am always looking for quick and easy ways to make a dessert my family will love. I just knew these combinations of flavors would be a big hit and blended perfectly together. Check out the easiest way to whip up an incredible tasting dessert in no time! The freshness of the strawberries just puts this one over the top! In a medium size, bowl add the vanilla pudding with whipped cream cheese and blend together until smooth. Fold in the thawed whipped topping. Set aside. Line a deep dish around 8x8 inch square pan with graham crackers for the first layer. 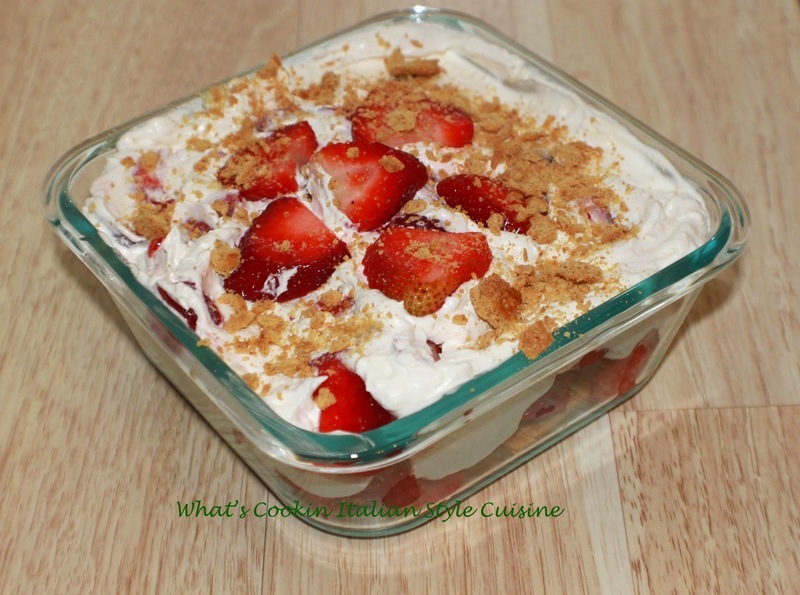 Add a layer of sliced strawberries, then the whipped filling mixture, more strawberries, top with graham crackers and repeat ending with whipped topping. Save some strawberries to top for garnish. Best refrigerated for at least 3 hours before serving but who could wait? Not us! Enjoy! This recipe would be perfect for those sultry no bake summer days or anytime we feel the need for delicious.